We are proud to announce that our experienced Web Development Team recently launched one Web Application for Online Admission to B.A, B.Sc, B.Com this year. Our online admission software is running in renowned colleges in West Bengal & Orissa. This web based software introduces new dimension in College admission these days. This will reduce lot of hectic work for the Students & their Guardians (Long wait in the Queue) as well as the Teachers/Professors/College Authority to involve in Short listing/Screening/Sorting etc. No more queue – You can do it in front a Computer. Freedom to fill up forms at your convenient time. Maximize Accuracy, Transparency, Reliability & Productivity. Fully Dynamic Database Driven Software. Secured & Password Protected Admin Panel. Self Hosted software – you can run on your own server after getting full copyright/license. College Admin has Full Control of Data. Online Payment through Indian Bank. Students can apply online through Online Form. They can take Print Out of their Application. Check Status of the Admission. They can check Merit List Status of their own. Monitoring of the admission process. Real time Data, Merit List Generation. Download Student data in Excel Format. Database Backup from the Dashboard. View Live working version of Online Admission Software. 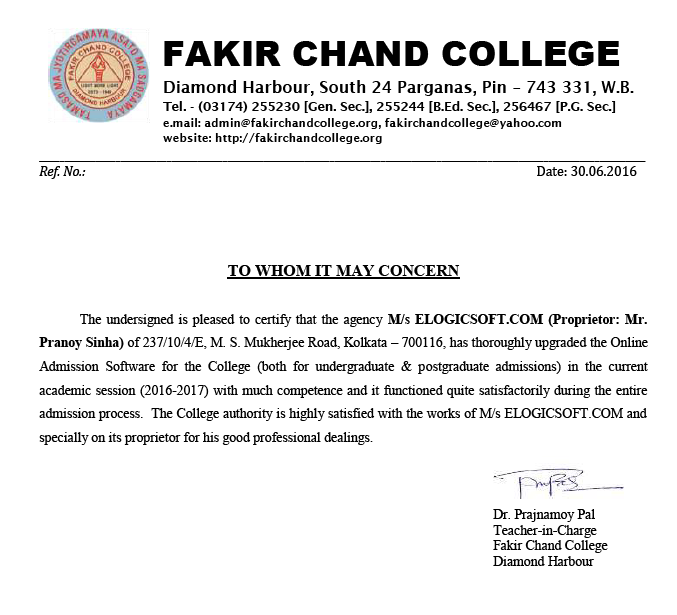 College: Fakir Chand College, Diamond Harbour, South 24 Pgs, West Bengal. – For admission to B.A, B.Sc, B.Com: Click here. – For admission to P.G Section: Click here. Letter of Appreciation from the Principal’s Desk: Click here to view. – For admission to B.A, B.Sc: Click here. We will charge one time price and you will get license to run the software in your Server. Free updates for 3 years. Please email to [email protected] or Call: +91 82406 13706 / +91 94328 42707.